Thursday 17th July 2014 sees a change of day from my usual Friday outing – initiated by forecasts earlier in the week of Friday being a wet day and Liz’s desire to do dressmaking instead and so only myself to plan for. As it happens, today, Friday 18th, has been a nice day although local and not so local people report a heavy storm happening at 0300 but Liz and I must have been well in the Land of Nod at that time as neither of us heard or saw anything of it. Anyway, 0615 I leave the house heading to the club’s silver/tench pool and arrive at the gates there at 0650. No cars on the near end car park on arrival and so I thought, as per usual, I was the first there. However, on driving up to the far end of the pool where I intended to fish, I discovered a parked car and some obviously keen angler already set up and fishing around the far side of the pool. Subsequently, it turned out that this angler was Simon, our club’s web and forum administrator. 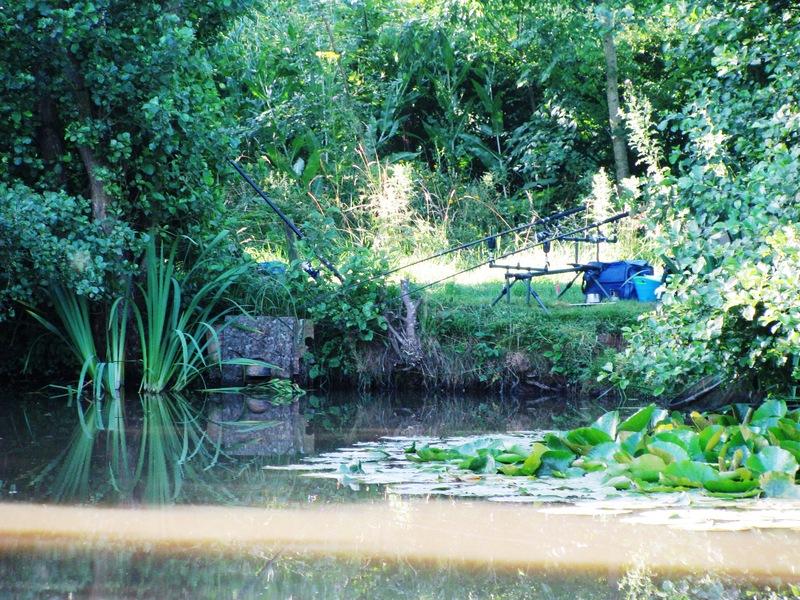 Anyway, Simon was based several pegs on from my ‘wanted’ swim (peg 14) which is the only peg on the long and narrow pool that faces down the length of the pool rather than from the sides across. However, it faces directly at the pool’s island about 15-20 yards away and so the area is sort of a pool-in-a-pool contained by the island and the pools sides each around 15 yards to either side. So I had two immediate areas to fish – firstly towards the island and its overhanging vegetation – usually a good bet (word ‘usually’ used guidedly as you will see later :D) – and secondly there were those lily pads just off to my left as I fished. 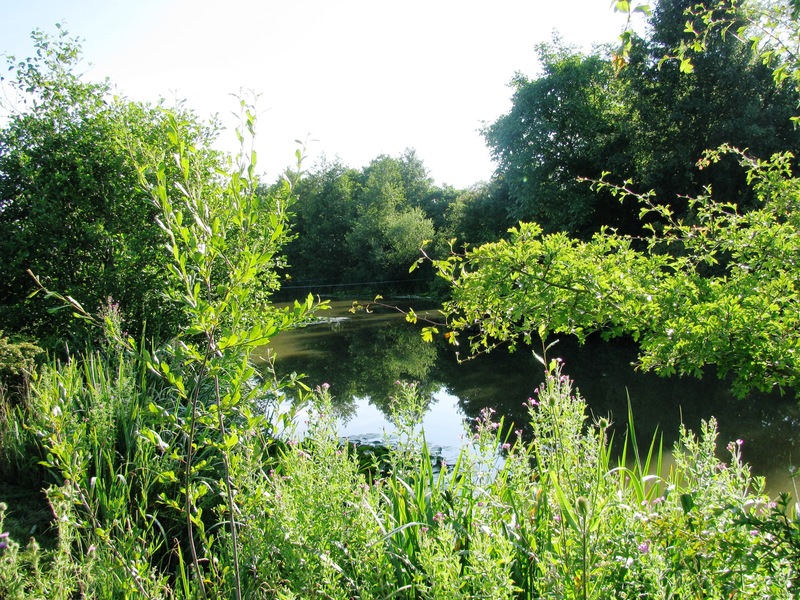 And so, the first thing I did on arrival was to bait up those areas – the island receiving the major ‘dosing’ as it was intended to be my main swim and a lighter spread put out on the far corner edge of the lilies to act as a ‘switch’ swim. Baiting was done by spombing a breadcrumb base with the addition of prepared particles (hemp/maize/wheat) and maggots and made ‘active’ by the further addition of ground dry seeds (standard wild bird seed basically) that had been blitzed and coarsely ground in a food processor – the idea that these tiny dry particles soak in water and ‘snap, crackle and pop’ like your favourite breakfast cereal and so small pieces are constantly moving upwards and downwards in your baited area as an attractant. And so it was at 0750 I made the first casts with my two leger rods out towards the island but falling short (but not far) of the desired position and as they were lying in the baited area they were left in that position. When groundbaiting/loose feeding, I try to do so so that the bait is spread over a relatively wide area. I fail to see the point of concentrated feeding as (a) you are limiting the chances of a fish passing in the near vicinity by being attracted (if, for example, your feed is lying in a 1 metre circle than its going to be easy for a fish to pass 2-3 meters away and be oblivious of it – depending on depth and water clarity obviously and (b) having spotted your feed and grazing on it a fish in a tightly fed area only has to swim a few inches to the next item which means that bite indication is similarly subtle – but I want a fish to pick up a bit of feed and have to move a distance measured in feet to the next item so making indication more noticeable and less twitchy… So, in general, I try to lay g’bait and loose feed over a sort of 10-15 foot wide radius as it lands on the water, and obviously as it falls through the water it will spread even more as underwater currents take effect and, of course, the lighter constituents of the mix will fall slower than the heavier ones thus spreading more. Actually, the ideal baiting up pattern is to aim to create a large ‘Y’ as that shape is the most efficient in making the bait visible to fish swimming into the area from all directions and then drawing them inwards towards the centre of the ‘Y’s fork whilst minimising the amount of feed required for this. The baits were a small luncheon meat cubes, about 6 or 7, fed up the line on one rod and a ½” cube of strawberry jelly bread on the other. However, I slightly deviate from the published recipe below by adding some extras… and have also before now made it up from flavourless gelatine powder and added my own flavouring which allows you to use flavours that jelly is unobtainable in – like ‘green mussel’ or ‘monster crab’. So, I fished like this for a few hours and had a few pulls but had not connected and decided to re-bait and re-cast both rods which I did, perfectly in fact with both baits just brushing the island’s foliage as they entered the water… job done I thought… and then I had a take and struck, meeting resistance… but unfortunately not the resistance of a resisting fish but that of a tough but slowly yielding snag. Anyway, I continued to apply pressure and eventually a line of plaided nylon cord arose from the water, one end attached on the island the other end seeming to point to the corner of the pool to my right… further pulling raising more and more of this cord but eventually my line gave way and that was that. But, before re-tackling the rod I thought I’d wind in the other rod, re-bait that and re-cast… and when I went to do that… yep, that one was also entangled on the same cord again ending with my tackle getting snapped off. Anyway, with both leger rods now out of action and requiring attention and having not really had a lot of action on them anyway, I decided to pack them away and to get the float rod out and fish worm and maggot around the baited lily pad section to my left, which I did for the rest of the day, packing up at 1600, and from which I captured 3 perch – for probably a total weight of less than 3 oz! So, not a great day for catching… and from my previous visit and speaking to Simon who also had had a quiet session – he moved to adjoining carp pool during the day – it seems that the pool had been very quiet – and a recent match was won with just a few pounds and not many tench had shown up then. But a possibility for this ‘problem’ is the amount of natural food that is available due to the hot weather. I wanted to see how my jelly bread stood up to immersion in water and so I dipped a pot into the edge of the pool to get some to drop a sample piece in… and immediately obvious were a large number of small black water beetles… and as one’s eyes focussed more and more a myriad of pond life was apparent (midge larvae, daphnia, etc), so abundant it looked like the pond sample was 90% water and 10% fauna almost… Basically a fish would only need a few mouthfuls to fill it’s belly for a week! So, maybe that the fish are naturally well fed and don’t need to scavenge or take large or ‘unnatural’ foodstuffs. OK… now we get to the ‘dunking’ episode… that rope that snagged my two lines… well, it kept playing on my mind… and there is a small boat that is kept at the side of the pool… and so before leaving I went and grabbed the boat with the intention of rowing over to the island, cutting the rope free from that end and then pulling the boat back to the mainland with its help. Good idea… but I sadly failed the first bit of the exercise in practice ie the launch of the boat from the bank… I got the boat in the water OK with a 1’ drop down to it but attempting to climb in at the back I was unable to get my footing into the centre and the boat started tipping over, which made me fall, which made the boat tip more and take in water which tipped it more until finally I was deposited, on my side, into 2 feet of water and the boat was full to the gunnels with water. Climbed out of the pool and after much effort (ie try pulling a boat full of water up 1’ of vertical bank!) I succeeded in getting the boat out and tipped over to empty the water. I then managed to launch successfully but placing the front of the boat on the water whilst the back end was angled up and on the land and after wriggling and wobbling I managed to slide it gently down onto the water… rowed to the island, located the rope which I cut free, and then followed the plan of pulling on the rope to head homewards… and discovered that the rope at that end was not attached to anything but basically just buried under silt on the bottom of the pool as eventually it just came up to hand. So rowed for land, successfully beached and pulled the boat out and returned it to its home location. And packed up tackle and head home ‘soggy bottom’, ‘soggy paper money’ and all. Surprising thing was that my cheapo £5 watch is none the worse for its soaking and been happily plodding along ever since unperturbed! And the water WAS warm (20+C) :D. And actually its not the first time the boat has dunked me – the previous time I had cast out a line and it had become entangled around one of the ropes and eventually snapped with a baited hook swinging a few inches above the water line. A bit concerned for a duck grabbing it and getting hooked, I went and got the boat, rowed out and cut away this potentially dangerous bit, and rowing back to shore… but on trying to get out I ended doing the stereotypical splits with the boat moving out from the land until the inevitable happened and distance twixt bank and boat exceeded maximum distance I could attain between left and right feet – SPLASH!! :). Plans for the forthcoming week are to re-visit the new section of canal I went to last Tuesday, this time with a bait rod, and see what I can get it to produce and hopefully a late week trip to somewhere undecided as yet. ← Session 35 – ‘You Can’t Catch Me I’m Part Of The Union’ They Said – But Some Staffs-Worcs Perch Are Blacklegs!